Growing up, I watched a lot of TVB dramas. I mean, A LOT. You name it, I probably watched it. So, it’s no surprise that some of my fondest drama memories is for TVB dramas. There have been so many great dramas throughout the years that are known for not only their memorable characters and stories, but also the classic theme songs. With all that TVB-watching experience, I’ve come up with a list of my top 10 favorite TVB songs that feature not only a glimpse into some of my favorite songs, but also favorite dramas. You can be sure that I listen to all of these songs on the regular, and still love them as much now as when I first heard them. I hope you’ll be able to reconnect with a song/drama from the years past or find a new song to listen to! 10. Bowie Lam – 兒女/Children from War and Beauty (2004). Listening to this makes me wish that I lived in a Chinese imperial palace and wear elaborate headdresses, but not the one in the drama because that was a no fun place. One out of 2 ain’t bad, right? 9. Andy Lau – 缺陷美/Flawed Beauty from Reaching Out (2001). When one of Hong Kong’s Heavenly Kings lends his voice for a drama theme song, you know it’s gotta be good. Reaching Out might also be one of TVB’s most underrated gems. 8. Jacky Cheung & Kit Chan – 醇酒醉影/Country Spirit from Country Spirit (2001). Another HK Heavenly King, another great song…but impossible to sing along! Anyone else really miss Gordon Lam in dramas? 7. Leo Ku – 義海豪情/No Regrets from No Regrets (2010). There’s a pretty badass electric guitar solo midway through the song, but then again, this entire song/drama/cast was so epic and badass. Who knew Leo Ku could be so cool. 6. Raymond Lam – 忘記傷害/Forget the Pain from Survivor’s Law (2003). A drama from when Raymond was still a baby, but his voice was already chocolatey smooth. Dark chocolate, of course. 5. Ron Ng – 紅蝴蝶/Red Butterfly from Rosy Business (2009). Has Ron ever sound more beautiful and “gentle” than in this song? I think not. And when they would occasionally play this during the indirect sequel, No Regrets? ALL the feels. 4. Miriam Yeung – 快樂與哀愁/A Taste of Love from A Taste of Love (2001). Someone please get me some fried rice in a crab shell because this was legit one of the greatest and most delicious dramas ever. Miriam’s song was also so good that it made Raymond (Ha Tou aka Shrimp Head!) fall in love with her. 3. Hacken Lee – 心計/Scheme of the Heart from Revolving Doors of Vengeance (2005). “I’m incapable of letting go and unable to lose. But when I have the whole universe, I suddenly miss you.” Damn you’re good, Hacken. Revolving doors of vengeance…and love? 2. Eason Chan – 歲月如歌/Like a Song from Triumph in the Skies (2003). So uplifting sounding, kind of like a plane taking off! Ha…get it? But in all seriousness, all I really do imagine are blue skies and white clouds when I listen to this song. Who’s excited for the movie version of Triumph?! 1. Susanna Kwan – 講不出聲/Speechless from Heart of Greed (2007). I’ve saved the best for last because this is my favorite song for my favorite drama OF. ALL. TIME. Without a doubt, one of the best and most epic TVB dramas and songs ever. Everytime I listen to this song, I suddenly have the urge to act really melodramatically. Washing dishes melodramatically, walking down the street melodramatically, typing melodramatically, folding socks melodramatically, etc. You get my drift. Seriously, this is just SO good and Susanna’s a straight-up OG, of course. Nancy Sit – 皆大歡喜/Everyone is Happy from Virtues of Harmony (2001). Julian “Chilam” Cheung – 祝君好/Wish You Well from Return of the Cuckoo (2000). Chor Gor Gor! Who’s excited for the Return of the Cuckoo movie?! I also asked two of my best friends and fellow TVB-watchers what their all-time favorite songs are, and these are their picks. Check out that 17 year difference between the dramas! What can I say…we were practically raised on these dramas lol. Joyce Lee – 真情細說 /A Kindred Spirit from A Kindred Spirit (1995). Joey Yung – 連續劇/Drama Serial from A Hippocratic Crush/On Call 36 Hours (2012). While this is only the top 10 of my favorite TVB songs, there’s a lot more songs out there that I love. Who knows…maybe this will just be part 1 of an ongoing series. After all, there are new dramas coming out all the time with new songs! If you want to check out some of mine and Estelle’s favorite songs from other non-TVB dramas, take a look at our Drama OSTs & Songs Rankings. What are some of your favorite TVB songs? List ’em in the comments below! Oh ye! Growing up with TVB! TVB was childhood. Renting TVB was childhood lol! I am also in a while different generation to yours where my TVB watching started around 2004? Rewatching that Heart of Greed montage brought back good memories, i never noticed that the actor’s hair was like that and the way they dresssed lol. Your no. 1 is definitely in my top. But i only started to actually notice the ost’s so my fav’s are very recent like Jinny Ng’s 想起你 from Storm in a coccoon, lady sour’s duet by Myolie and Ron, On my way by Raymond Lam in TITS2, Ruco and Edwin’s theme song in Brother’s Keeper, Fred Cheng’s song in Officer Geomancer and even that song from When Heaven Burns. 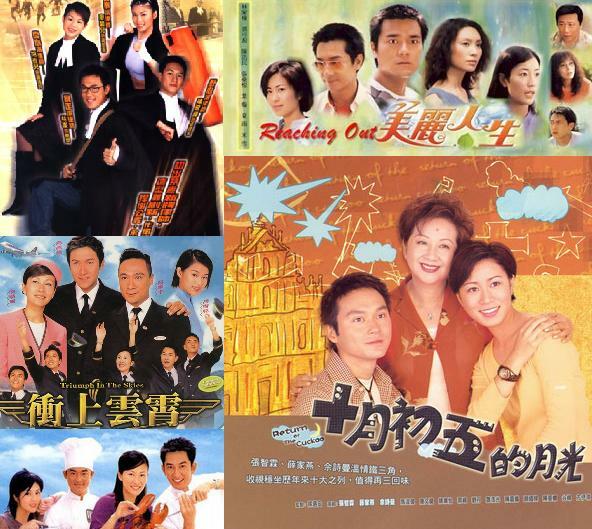 My fav TVB dramas would be too difficuilt to choose but i remeber how deep of an inpression myolie’s To grow with love had on me as well as A chip off the old block, Storm in a cocoon and Brother’s Keeper. Tbh TVB dramas dont inoact that deeply on me, but rather the process of watching TVB dramas is just religious for me. I can’t ever inagine livving without TVB. Omgosh i almost forgot! On the first beat was my all time favourite! Ron and Sammul double the hotness lol. @lifewithdramas, I loved OTFB too! Ron and Sammul were such a good bromance pair in that. Chip Off the Old Block is one of my all time fave dramas too. I still watch it when I have nothing else to watch haha. My recent song faves are definitely the Ron and Myolie duet from Lady Sour and Fred Cheng’s ending theme from Overachievers. Lol is it obvious that I’m a big Ron fan? @cloudnsea, Ahh, Dicey Business! I was such a huge Bosco fangirl back in the day…the Boscolie days. Thanks for introducing me to the second song; so good! Who knew Moses had such a nice voice?! Didnt watch the drama, but now I kind of want to bc of the song lol. I watched “A Kindred Spirit” when I was about 2 1/2. I am now almost 23 and I still have the opening theme stuck in my head!!!! this is my first time visiting this blog and you don’t even know how happy I am to see this post. this post just brings back so many memories. growing up with tvb, it’s seriously been so many years since i’ve even heard some of these songs. Yay, welcome to our blog! Coming up with this list brought back a lot of good TVB memories for me too haha. I was watching the movie version of Triumph and they played the Eason song, omg…all the feels! I miss those old school TVB dramas and songs. The new ones just aren’t as good!